One of the core parts of the MICO project will be the MICO platform, an environment that will allow to analyse “media in context” by orchestrating a set of different analysis components that can work in sequence on content, each adding their bit of additional information to the final result. Analysis components can e.g. be a “language detector” (identifying the language of text or an audio track), a “keyframe extractor” (identifying relevant images from a video), a “face detector” (identifying objects that could be faces), a “face recognizer” (assigning faces to concrete persons), an “entity linker” (assigning objects to concrete entities) or a “disambiguation component” (resolving possible alternatives be choosing the more likely given the context). 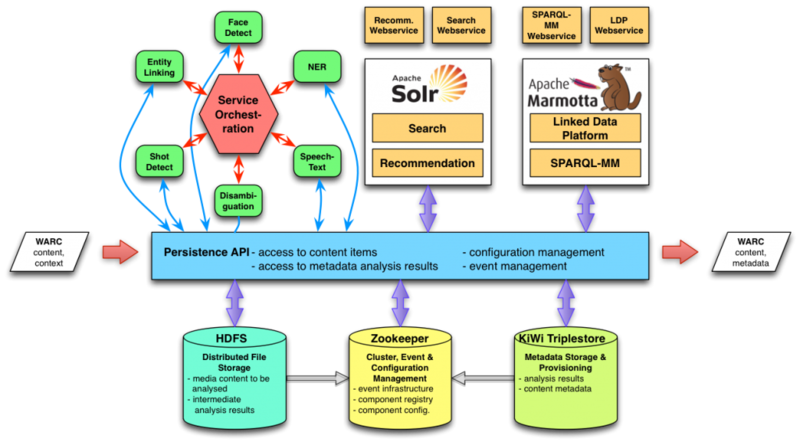 Apache Marmotta with its KiWi triplestore provides metadata storage for content items. Each content item will have its own named graph to represent metadata. Apache Camel (or Zookeeper) for event communication between components and execution of an analysis process. Apache HDFS (or another distributed file system) for representation of binary content of content items; using a distributed file system simplifies running the computation where the data is located. Execution Plans An intelligent orchestration component takes care of planning the execution of the analysis process for a given content item based on the analysis goals and available data. Analysis services can register with the platform, state their input requirements and outcomes, and are then considered in execution planning by the orchestration component. The following diagram illustrates how a possible execution plan could look like: When a content item is injected into the platform, the orchestration service first takes care of the execution planning. In this case, it recognizes that the input is a video file and that the user wants to identify persons. The first component in the execution plan is a video/audio splitter. The audio part is then forwarded to a speech-to-text component for further text processing, while the video part is forwarded to a keyframe detector for later face detection and recognition. After the (possibly parallel) analysis components have finished, a disambiguation component tries to remove inconsistencies between the outcomes of the different components. The resulting data is then published in RDF for other applications to consume.